The best possible way for makin’ oven-baked bacon! Drippings away for a healthier option and hot air circulates underneath so there’s no need for turning. For flat, evenly cooked bacon without the mess! Think beyond bacon too…great for making jerky, dried fruits, crisp fries, veggies and more! The pan’s four corners act as pouring spouts for easy disposal of bacon fat when cooking is finished. Better yet, line the pan with aluminum foil prior to baking for hassle-free cleanup. Before initial use and after subsequent uses, hand wash in warm soapy water. Extended soaking of rack in water is not recommended. 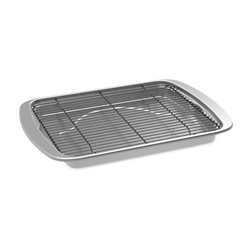 Dishwasher use is not recommended and may discolor the aluminum base pan, but will not affect cooking performance. Preheat oven to 400° F and ensure that your oven shelf is in the center of your oven (not too high or too low). Place bacon slices in a single layer directly on the rack, ensuring that slices do not overlap each other. They can be spaced very closely together. For chewy bacon, bake 10-12 minutes or until desired level of cooking is achieved. Once the bacon has reached your desired level of crispiness, remove immediately. I had been looking for for baking rack like this. Best purchase I made. Great for my bacon, hassle free, no having to watch bacon to keep from burning, keeps bacon from curling up-flat and great to layer in sandwiches. Great for tater tots. Highly recommend it.